We plan to add some online exhibitions to make use of the images that are now available. If you’d like to contribute some words on a topic that interests you, we’ll help you turn it into a fully-illustrated online story. Please contact webmaster@maidenheadheritage.org.uk. Aerial photographs from the 1920s to the 1970s are brought together in this self-exploration exhibition. Click on the image to proceed. 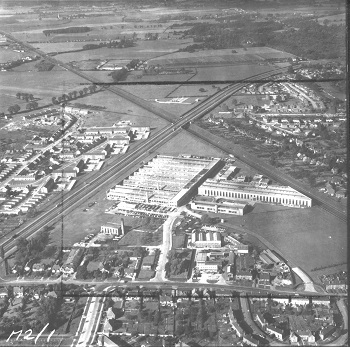 We have selected 20 of the most interesting images in the Maidenhead Heritage Centre collection, captured by Fairey Surveys, Aerofilms and others, to illustrate how the town has grown and changed over the years. Open fields now built upon, shiny new housing estates, factory sites that have since been redeveloped, the town centre before the ring road, Braywick Park in its former life as the town landfill site – just some of the snapshots in time available here. Explore the images yourself from wherever you are using the zoom-and-pan viewer. Contribute your observations and comments. A superlative resource for the local historian. Old Ordnance Survey maps are now available online, reprojected to be directly comparable with modern maps like Google Maps, Bing, Open Street Map and others. Using this service, you can easily see then-and-now. Change the transparency to see both together. Difficult relations with Russia are nothing new. In this online exhibition, learn how the 45-year-long Cold War affected Maidenhead. 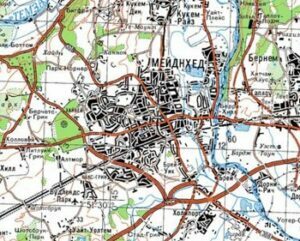 Visit the online collection of detailed Soviet military maps of our country.